Death Valley is one of the driest places in the US. But it does rain every once in a while and when it does, look out. Thunderstorms apparently come to the valley every 20 years or so. The last really big rain was in 2004. 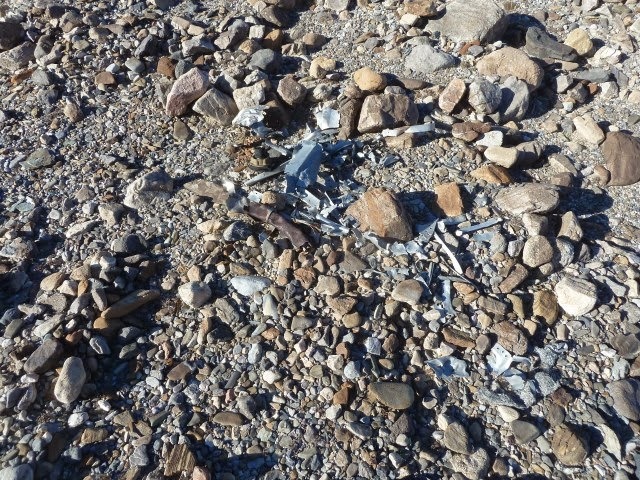 Being such a dry place, Death Valley has little vegetation to hold back the runoff when it does rain. 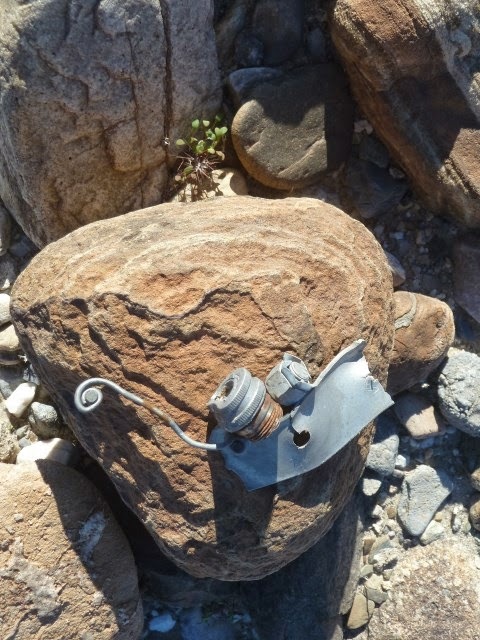 Given that Death Valley has mountain ranges on both sides of it, any rain in the mountains runs down canyons and rushes out into the valley carrying with it gravel, mud and in many cases, stones of good size. 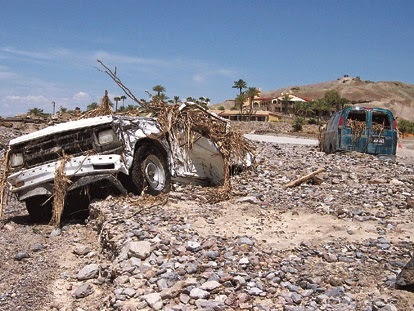 Since the invention of automobiles, rain also carries automobiles down into the valley along with rocks and other debris. 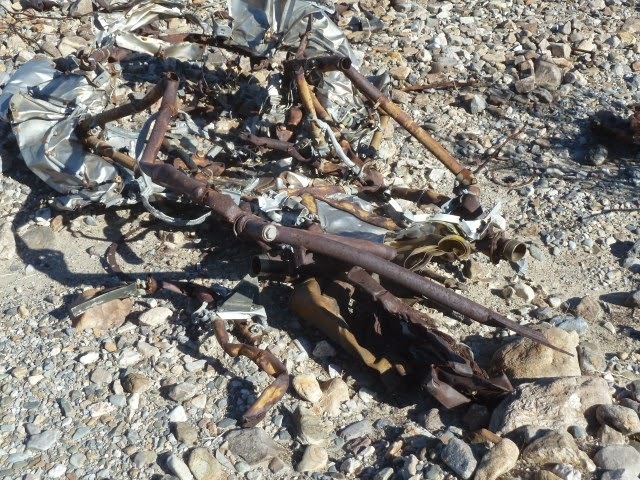 We encountered one such automobile on one of our hikes up toward Trail Canyon in the Panamint Mountains. At first I thought that what looked like a dune buggy had caught on fire and then at some later time gotten pummeled by energetic youths. leaving behind parts like this. 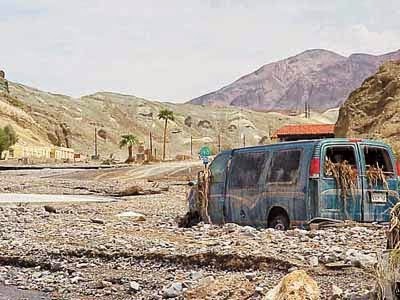 Picture of a van that was caught in the flood at Furnace Creek Inn. 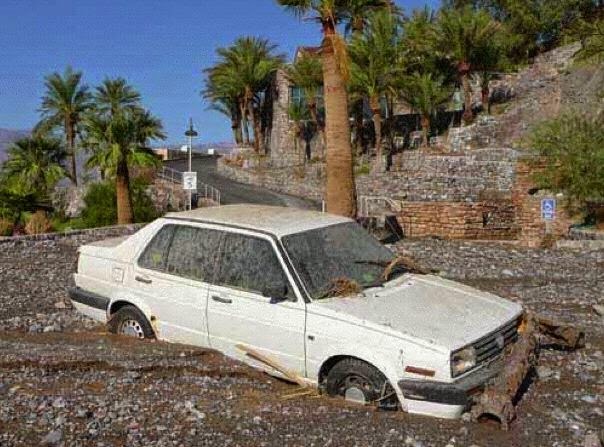 And another car caught in the flood. And another at some unknown location. 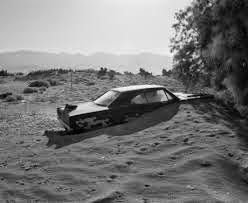 A guy working at the Borax Museum at Furnace Creek told us that a friend of his lost his car in the flood at the Inn and that the car had never been found, apparently buried under a load of gravel.. In any case, rain is a rare event in Death Valley, but should you ever be there when it does rain, look out and don't be caught in what is a dry creek bed most of the time except when it rains at which time it becomes a wet creek bed transporting tons and tons of rocks and mud downhill toward the valley floor.